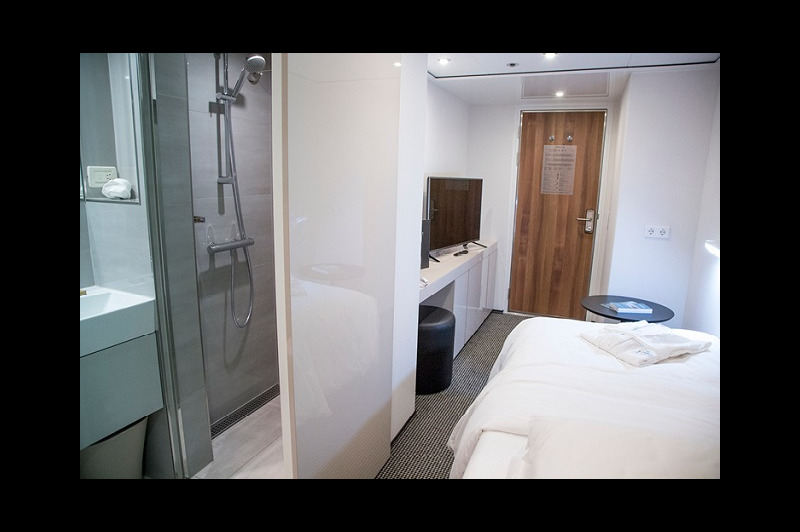 The large, outward-facing cabins have all panoramic windows, twin beds, TV, minibar, safe, hair dryer, air conditioning, shower and WC. The reception and the on-board boutique are located in the entrance hall. The elegant restaurant, the panoramic lounge furnished with great attention to detail, and the bar guarantee that the guests will have an enjoyable time. The elegant library has an extensive range of books for the guests to browse through. The indoor swimming pool, with a counterflow installation, the sauna as well as the whirlpool on the sun deck offer fun and relaxation. The friendly crew will look after the guests from morning to night to cater for their physical well-being and ensure a good atmosphere. The hotel ship is centrally located on the river Rhine - scheduled at RSR berth - between the oldtown and the Oberkasseler Bridge. The oldtown is in a short walking distance, to the fairground it is approx. only 4.5 km. To hotel ship: from Düsseldorf Main Train Station by metro U74 / U75 / U76 / U 77 to stop TONHALLE. The hotelship is located in a short walking distance at the river Rhein/close to the Oberkasseler Bridge. To fair: the hotel ship is located in a walking distance to stop TONHALLE. By U74 / U75 / U76 / U 77 to stop Heinrich Heine Alle - then change to U 78 with a direct connection to Messe Düsseldorf/arena.